So it's holiday cooking season and if you're any like some friends of mine, you're starting to look for make ahead dishes. Well, this dish is certainly one you can make ahead. You can either bake the potatoes in advance before starting on the recipe or even prepare the dish and bake it when you're ready. This recipe also has a lot of room for creativity. 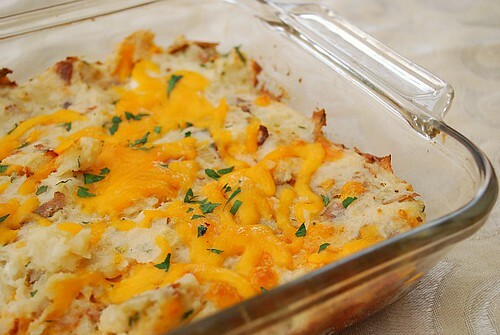 Essentially, it's just a mashed potato casserole that's baked... I just happened to add horseradish, cheese and bacon. Have fun with the recipe and feel free to experiment! Heat oven to 350 degrees. Grease a 13x9 baking dish and set aside. Wash potatoes thoroughly with a stiff brush and cold running water. Dry, then using a standard fork poke 8 to 12 deep holes all over the spud so that moisture can escape during cooking. Place in a bowl and coat lightly with oil. Sprinkle with kosher salt and place potato directly on rack in middle of oven. Bake 1 hour or until skin feels crisp but flesh beneath feels soft. Allow to cool slightly enough to handle and keep the oven on. Once cooled enough to handle, cut the potato in large dice and place in a bowl. 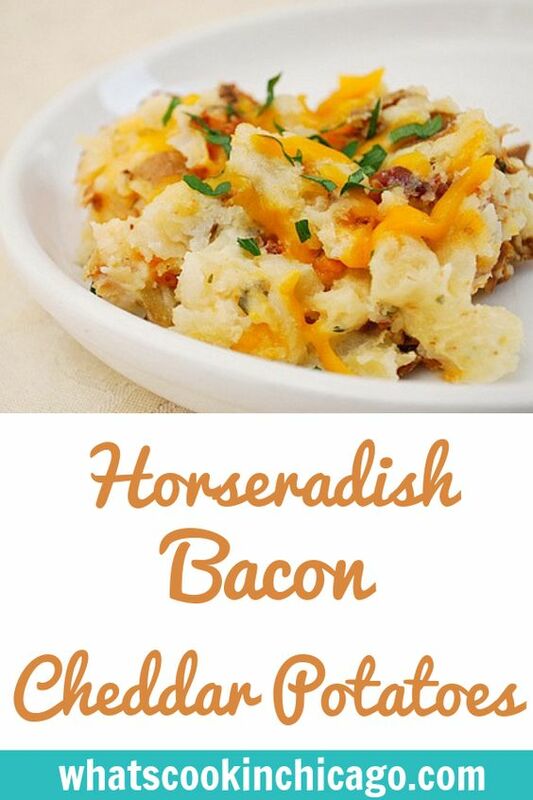 Add the cream cheese, half and half, half of the cheddar cheese, bacon and horseradish to the bowl. Using a potato masher, mash the ingredients together. Place in the prepared 13x9 baking dish, sprinkle the remaining half of cheddar cheese and bake in the preheated oven fo r 15-20 minutes until warmed through and cheese is melted. Before serving, garnish with green onions or parsley if desired. This is how I always make my mashed potatoes. So good! 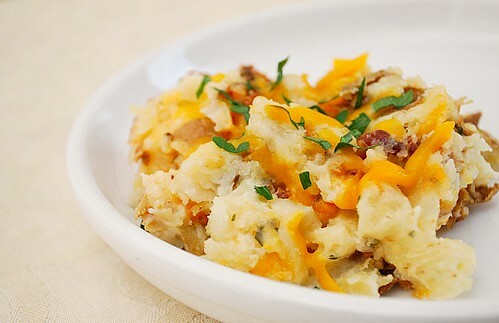 Cheddar baked potatoes looks so delicious! Yummy. I NEED to make these. They look SO yum! Um, yes. I'll take three heaping mounds of those, please. Thank you.